Lately, I’ve been enjoying adding oranges to my dishes. I’ve made this Vegan Orange “Chicken” a few times before and it’s so delicious. It can be made with Beyond Meat Chicken-Free Strips, tofu or tempeh. It can be made with seitan but then it’s more like Orange “Beef” which would also be fantastic. I’ve always thought of it as a Chinese dish and served it with brown rice but the last time I made it, I didn’t feel like rice. 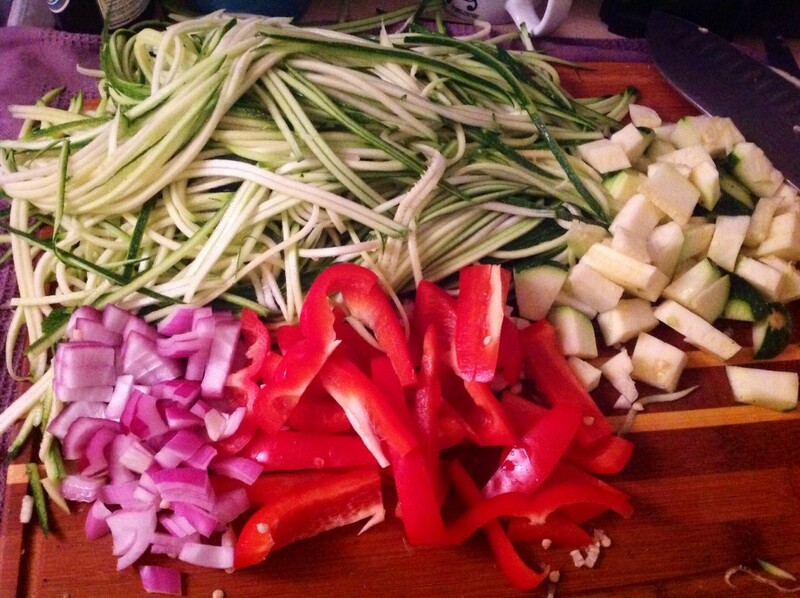 I had 4 big, beautiful zucchini and I love taking my julienne peeler and making long, thin noodles out of them. If you have a spiralizer (lucky you), you can use that as well. Zucchini noodles are a great way to have “pasta” without any of the carbs or grains. They can be eaten raw or lightly sauteed which is what I usually do. When you get to the “cores” of the zucchini, you can either dice them up and add them to the dish, as I do, or save them in the fridge for another day. In this dish I sauteed the zucchini noodles, along with some red bell peppers and red onions in garlic and red pepper flakes and then cooked them further in the reserved orange marinade. 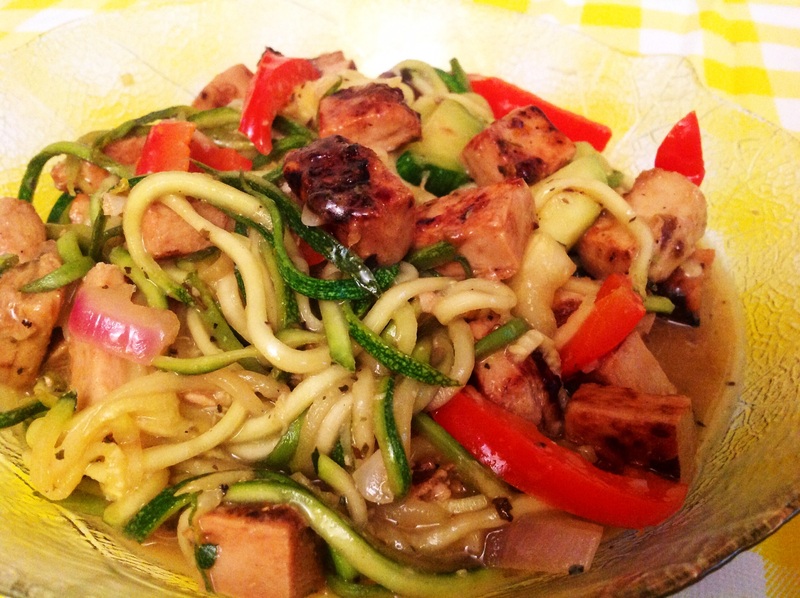 The leftover marinade made a lovely sauce for the zucchini noodles and the resulting dish tasted savory and fruity at the same time. 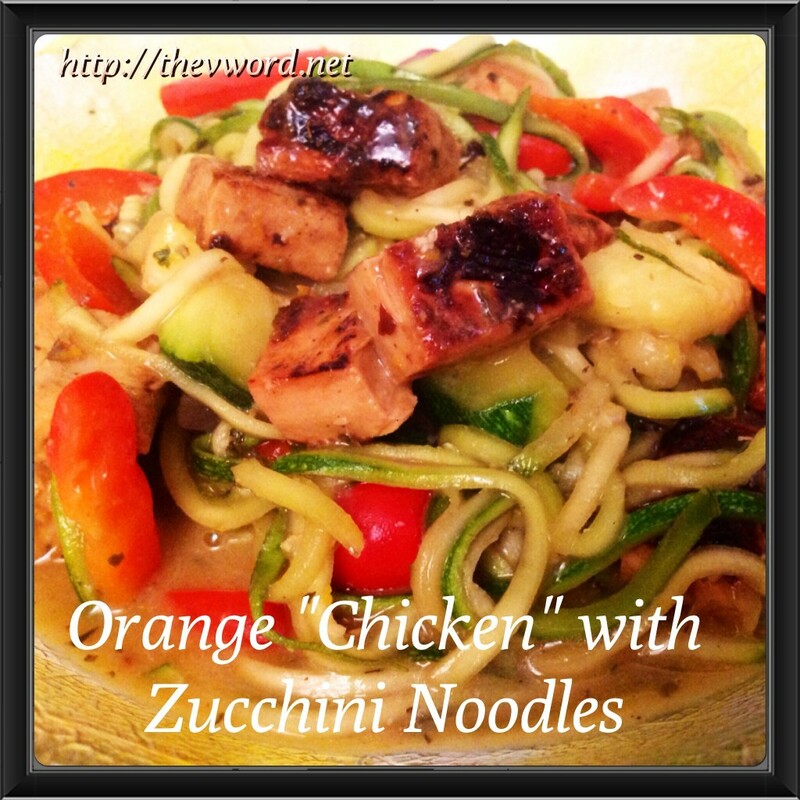 The Orange “Chicken” is crisp yet tender with an amazing orange flavor that mingles with the tamari, garlic and ginger. The brown sugar balances the red pepper flakes for a dish that’s perfectly sweet and spicy. Serving it over rice is delicious but serving it over Zucchini Noodles and making a sauce out of the leftover marinade makes it an extra-special dish that’s extra scrumptious. Enjoy! For the marinade: In a large bowl, combine the olive or sesame oil, garlic, scallions, ginger, tamari, orange juice, brown rice vinegar, lemon juice, brown sugar and red pepper flakes. Mix well. In a separate mug or bowl, mix the arrowroot and water together until smooth. This is a slurry. Add the slurry to the marinade and mix well to incorporate. For the Orange “Chicken”: Add the cubes to the marinade and let sit for at least 20 minutes. Heat the vegetable oil in a large skillet over medium-high heat. Remove the cubes from the marinade and pat them dry. Reserve the marinade for the noodles. Arrange the cubes in the skillet in a single layer and cook until browned and crisp on all sides, about 8 minutes total. Transfer the “chicken” to a plate. For the Zucchini Noodles: Heat the olive oil in the same skillet over medium heat. Add the garlic and red pepper flakes. Cook 1 minute until fragrant. Add the red onion and the bell pepper to the skillet and cook for 3 minutes or until softened. Add the zucchini to the skillet and toss to coat in the seasoned oil. Add the reserved marinade to the skillet to create a sauce for the zucchini noodles. Toss to coat the zucchini in the sauce and cook until the sauce thickens and is warmed through, about 5 minutes. Add salt and pepper as desired. Return the “chicken” to the skillet and toss with the zucchini noodles. Serve immediately. In a large bowl, combine the olive or sesame oil, garlic, scallions, ginger, tamari, orange juice, brown rice vinegar, lemon juice, brown sugar and red pepper flakes. Mix well. In a separate mug or bowl, mix the arrowroot and water together until smooth. This is a slurry. Add the slurry to the marinade and mix well to incorporate. Add the cubes to the marinade and let sit for at least 20 minutes. Remove the cubes from the marinade and pat them dry. Reserve the marinade for the noodles. Arrange the cubes in the skillet in a single layer and cook until browned and crisp on all sides, about 8 minutes total. Transfer the “chicken” to a plate. Add the onion and bell pepper to the skillet and cook for 3 minutes until softened..
Add the zucchini to the skillet and toss to coat in the seasoned oil. 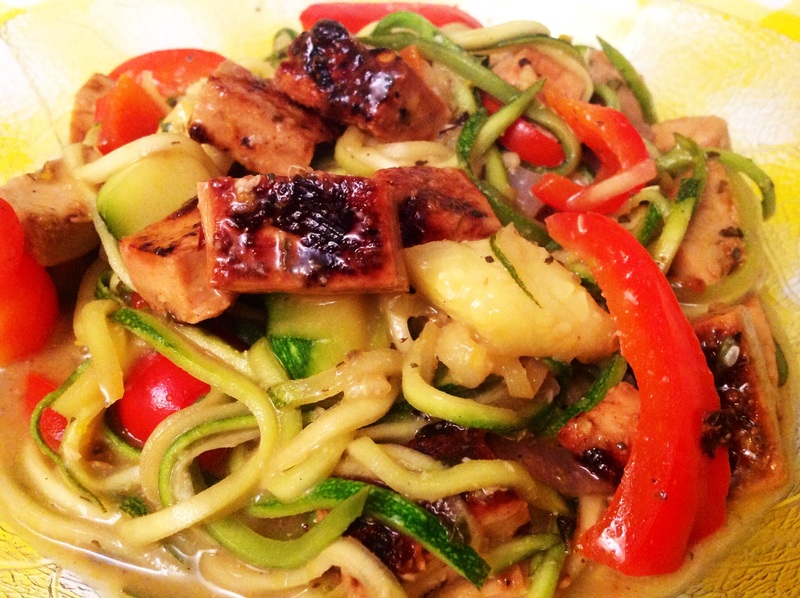 Add the reserved marinade to the skillet to create a sauce for the zucchini noodles. Toss to coat the zucchini in the sauce and cook until the sauce thickens and is warmed through, about 5 minutes. 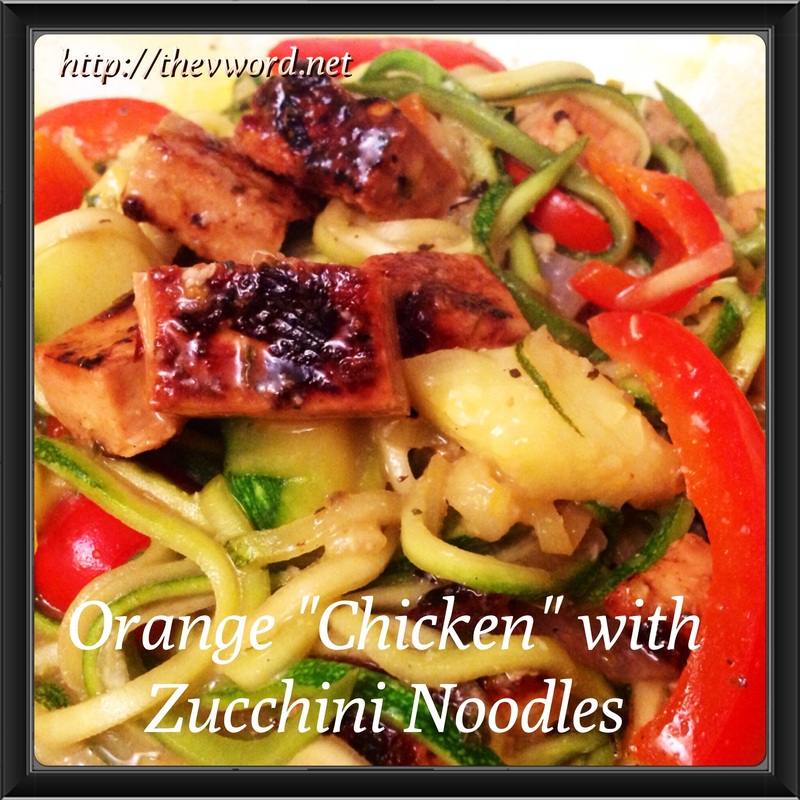 Return the “chicken” to the skillet and toss with the zucchini noodles.